Tando Resources (ASX:TNO) has announced it is set to start an extensive two-pronged drilling program at its SPD Vanadium Project in South Africa in August. The imminent start of drilling follows notification of grant of the Mining Right for the SPD Project by the South African Department of Mineral Resources. Drilling contractors have been engaged and will commence mobilising shortly, with site preparations already well advanced. Phase One of the drilling program will comprise 18 holes for 1,650m at the SPD deposit, where there is currently a resource of 513 million tonnes at a grade of 0.78% V2O5 defined under the SAMREC code. This resource is a “foreign resource”. The drilling is aimed at converting this “foreign resource” to a Mineral Resource estimate (MRE) as defined in the JORC Code. TNO expects the MRE will be published by October, 2018. Phase One will also include the first holes to be drilled at the shallow, high-grade vanadium pipes which sit within a 3km radius of the SPD deposit. The company has reported a host of high-grade vanadium assays from samples taken from the surface of these pipes with assay results consistently above 2% V2O5. According to the company, these vanadium grades highlight the strong potential for the pipes to underpin a simple, low-cost, high-grade DSO operation with a compressed development timetable. Following completion of the Phase One drilling program, TNO will move straight into Phase Two, which will be aimed at upgrading the maiden JORC Resource to an Indicated category (provided results are as anticipated). To achieve this goal, Phase Two is currently designed to comprise 58 holes for 5,550m. The cost to complete the entire Phase 1 and Phase 2 drilling programme and the resultant resource estimations is estimated at A$1.4 million. TNO has current cash reserves in excess of A$4 million and consequently is fully funded for the drilling program as well as the metallurgical and mining studies which will follow completion of the drilling program. 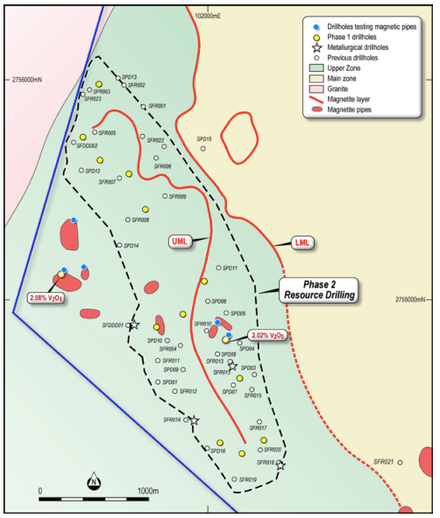 Phase 1 and Phase 2 drilling planned for the SPD Vanadium Project. Following the grant of the Mining Right, TNO has now completed formal due diligence on the SPD Vanadium Project. 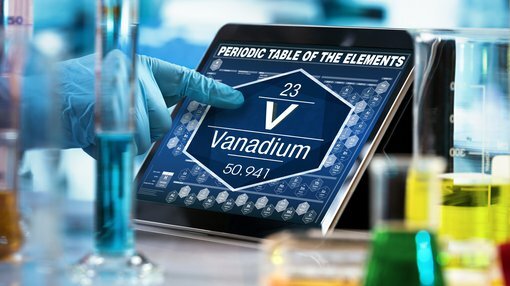 It is anticipated that acquisition of a 73.95% stake in the SPD Vanadium Project will occur in late August following satisfaction of the remaining conditions precedent, including South African Reserve Bank approval and approval by TNO’s shareholders at the general meeting scheduled for 20 August. TNO Managing Director Bill Oliver stated that the issue of the Mining Right was a significant step for the SPD Vanadium Project. “We believe SPD is a world-class vanadium asset. Our view is supported by the historical drilling results and more recently, the outstanding high grade results we have achieved from sampling the vanadium pipes on site,” he said. “We are confident that the imminent drilling program will justify our strong belief in the SPD Project, which we already know hosts an extensive deposit with high-grade vanadium.